The magic of a film isn’t solely conjured by the skill and nuance of its leading actors and creative team. The picture it creates has to be believable and detailed enough to lend itself to our suspension of disbelief and allow us to envelope ourselves in a different universe for the duration of the movie. There are many cases where a building or setting has become as ingrained in the iconography of a film as the characters portrayed. For example, not only is the Empire State Building one of the most recognised pieces of architecture in New York and the world, it is also central to the plot in many films such as An Affair to Remember, Sleepless in Seattle and King Kong. Australian family classic The Castle would be lost without its central character, the Kerrigan’s Coolaroo home, and who could forget Wes Anderson’s confectionary-coloured creation in The Grand Budapest Hotel? Here is a look at some memorable film homes that have stayed with audiences long after the credits rolled, including some festive favourites. The Southampton’s beach house in Nancy Meyer’s romantic comedy Something’s Gotta Give arguably outshone its stars Dianne Keaton and Jack Nicholson. One of the most popular movie houses of all time, the home is the subject of countless articles by bloggers and leading design magazines including Architectural Digest, House Beautiful, Country Style and Elle Décor. Though the interiors in the movie were purpose built sets, the exterior shots were of a real house located on Meadow Lane in Southampton (home to many industry leading residents including Calvin Klein). Built in 1999, the shingled home occupies over 740 square metres and includes eleven bedrooms. The house was used as a “visual barometer” for the overall feel and design of the interior movie set. Set decorator Beth Rubino remarked, “Hamptons houses that size have space, simplicity and a certain austerity,” which was then recreated in the movie’s design. The gorgeous mansion, which stands on a 2 acre block, was sold for a cool $US41 million in 2014.
Who could forget the pivotal scene in this 1980s classic when Ferris’ best friend Cameron totals his father’s 1961 Ferrari 250 GT, smashing through the glass pavilion that acts as the family’s garage? Cameron’s modernist family home is a real property located in Highland Park, Illinios, only a short drive out of Chicago. The property features two separate buildings, the older of which was designed by architect James Speyer and built in 1953. This original structure and main part of the overall build includes four bedrooms, four bathrooms, wooden panelled ceilings and glass windows in place of outer walls throughout much of the design. The iconic glass pavilion was added to the property in 1974. Designed by David Haid, a student of Speyer, the structure continues the modernist aesthetic of the main building and contains a kitchen and bedroom as well as capacity to hold up to four cars. The build is cantilevered over the ravine below and the wide expanse of glass windows offers stunning views of the surrounding woods from almost every angle within the home. The property was most recently put up for sale in 2009 and took five years to find a new owner, eventually selling in 2014. When designer Tom Ford made his directorial debut with the critically acclaimed, A Single Man, he chose to use an existing house in Glendale, California as the home of his title character, George Falconer. George, played by Colin Firth, is a British university professor living in Southern California in 1962 who has fallen into an overwhelming depression following the death of his partner, Jim. The quiet and seemingly peaceful and orderly nature of his home and surroundings is juxtaposed against the anguish he feels every day. The Schaffer House was designed by influential American architect John Lautner and completed in 1949. Constructed largely of redwood and glass, the home was planned around the existing oak trees on the property and features many small but interconnecting spaces, which give a feeling of privacy despite the large use of glass and an overall sense that the space is larger than it actually is. A fantastic example of mid-century architecture at its finest, the current owners of the home pay homage to the era by including period furnishings in their décor. Another Nancy Meyers film, The Holiday centres on two very different women, Iris and Amanda, as they swap houses over the holiday season as an escape after breakups with their respective boyfriends. Amanda, played by Cameron Diaz, lives in a sleek and stylish California home. The exterior shots of Amanda’s home are an actual house in San Marino, Pasadena, built by architect Wallace Neff in the 1920s. The home heavily features the Mediterranean influenced ‘California style’ Neff was to become famous for and reportedly boasts nine bedrooms, five bathrooms and over 900 square feet of living space. Though the interiors of the house were not used in the film, both the front façade and backyard with pool were featured in the film. The quaint English stone cottage belonging Kate Winslet’s character Iris struck a chord with many fans of the film thanks to its homely charm. Amazingly, the cottage doesn’t actually exist - the exterior of the cottage and extensive surrounding landscaping was constructed specifically for the film over just two weeks in an empty field near Surrey. As with the California home, the interiors of the cottage were also purpose built sets. 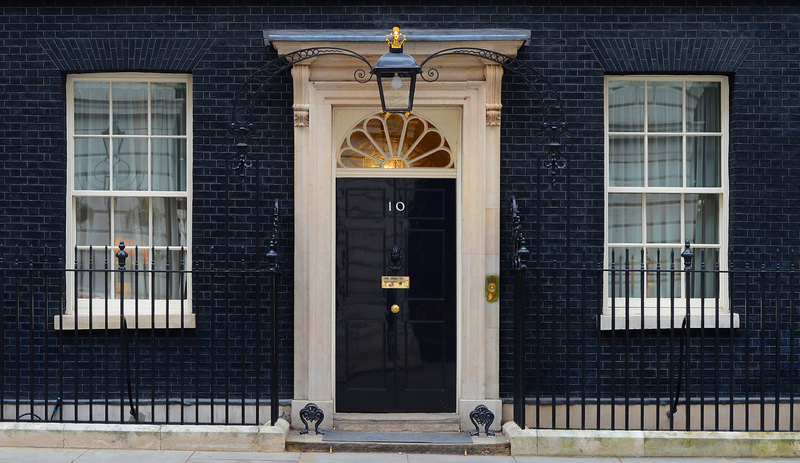 10 Downing Street has housed an incredibly varied list of residents in its time, both real and fictional, including the affable Prime Minister played by Hugh Grant in Richard Curtis’ Love Actually. 10 Downing Street was gifted to then Prime Minister Robert Walpole by King George II in 1735 and has housed prime ministers and members of parliament ever since. The famous black façade of the building was originally built in yellow brick, which became blackened by smog in the 19th century. The bricks were painted black in the 1960s as people had become so used to seeing them that colour. The black front door was originally made in oak but was replaced by a blast-proof steel door in 1991 after an IRA bomb was exploded in the garden. As another precaution, the door can only be opened from the inside and a guard is constantly stationed at the entrance. The building, which is actually two connected buildings, includes the famous entrance hall, cabinet room, State drawing and dining rooms, and numerous other sitting rooms, offices and of course private quarters. Many of the artworks, sculptures and furnishings on display are on loan from various sources including the Government Art Collection, National Portrait Gallery, Victoria and Albert Museum, and National Gallery. The red brick colonial Georgian home that is the centrepiece of the Macaulay Culkin classic, Home Alone, is a real house located in Winnetka, Illinois. The three-storey home contains four bedrooms as well as the familiar staircase, kitchen, office, and formal and informal dining areas that became settings for main character Kevin’s ingenious traps. The majority of the film was shot in and around the existing house although many of the indoor traps created by Kevin couldn’t be set up in a real house without causing damage and so were filmed on purpose built sets. Though the house has undergone some major redecorating since Home Alone's release in 1990, the overall structure and layout of the home has remained the same.